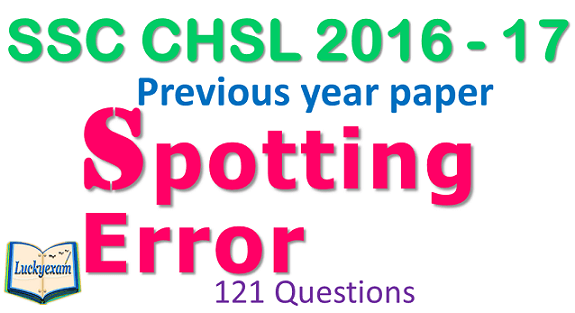 Hello everyone, here you will get SSC CHSL 2016 – 17 Spotting Error English Section with Explanation . There were total 121 SSC CHSL 2016 – 17 Spotting Error English Questions asked in SSC CHSL 2016 – 17 Exam in the month Jan- Feb 2017. We have already uploaded all spotting Errors asked in SSC CGL 2017 & SSC CGL 2016 on our website as well as in our YouTube channel. You must study them too. Instruction: – In the following questions, some part of the sentence may have errors. Find out which part of the sentence has an error and select the appropriate option. If a sentence is free from error, select ‘No Error’. Explanation: – Definite article ‘the’ should be used before the name of Indian forces. Ex- The Indian Armed forces is becoming more modern by buying and making new weapons. Ex: – Which of these roads shall I travel to go to Delhi. Explanation: – Whenever talking about a particular / definite thing, definite article ‘the’ should be used. Ex – I met the boy who was the topper of the class. Use definite article ‘the’ before temple. When nouns expressing period of time, amount of money or quantities are considered as a singular unit. Ex – He gave me a ten rupee note. Explanation: – Some nouns have only a singular form : furniture, wheat, happiness, scenery, news, information, luggage, bread, advice , furniture , flu, air, sugar, water, wine, tea etc. Luggage is an uncountable noun, do not make it plural by adding “s” , replace luggages by luggage. Thousand square (squares) meters, A ten rupee (rupees) notes etc. Explanation: – Stuck to hair means something is sitting on top of the hair whereas stuck in hair means it is intertwined with the hair. Ex – Both Riya and Priya were watching the movie. Explanation: – Obvious (adjective) – स्पष्ट, clear, apparent. Ex – It’s obvious to everyone that he’s a genius. Ex – The fabric of this cotton is very fine. Explanation: – Replace ‘gears’ by ‘gear’. As any vehicle uses a single gear at a time. Explanation: – Who is the subject of a verb (i.e. the one doing the action). “Myself” is a reflexive pronoun used when you are the object of your own action i.e., when “you” are doing something to “you” and related subject must be there in the sentence. Use Nominative case pronoun “I” instead of myself . Explanation: – As the sentence is in past tense, Replace ‘is’ by ‘was’. Ex – I met the boy who was the topper of the competition. Explanation: – Replace ‘request’ by ‘requested’. Explanation; – In this sentence both the actions are future actions ; but to express future time, after some conjunctions: after, when, before, as soon as, until etc.. we may use simple present tense. Ex – He’ll give it to you when you come next Saturday. Explanation: – Make a note of something – to write something down as a reminder. Ex:- Please make a note of it so that you may remember. Ex – I am married to Priti. Ex: – I appreciate your understanding of the matter. Ex – They do not approve of my staying with them. Ex- One should make one’s best efforts to pass the test. Explanation: – Use definite article ‘the’ or ‘possessive adjective’ before superlative degree. Ex – He is the best student of our class. sorts of—should be preceded by these and those and followed by a plural noun, ex:- these sorts of problems. Ex: – I have to work for more projects to make ends meet. Explanation: – Replace ‘since’ by ‘for’ as since is used to indicate point of time whereas for is used to indicate period of time. So the part (B) should be –not only in Hindi essay. With ‘told’ we need the object (e.g. ‘me’, ‘you’, ‘her’ etc.). Ex- He told me that he loved living in India. It is said that nothing is more important than good health. The watchman said to them, be careful. Ex – I felt a sense of harassment at the party. 3) effect on my students. Ex- It will have a tremendous effect on my performance. Explanation: – Inversion just means putting the verb before the subject. When the sentence begins with negative adverbial phrases, time expressions (for example – never, rarely, seldom, hardly, barely, no sooner, or scarcely) we may use inversion. Ex – Seldom have I heard anything about your achievements.